Deal or No Deal Star Prize is a fantastic looking £100 jackpot fruit machine from Bell Fruit Gaming. Using a variety of features from earlier fruit machines, DoND Star Prize makes for an entertaining way to win up to the £100 jackpot in a variety of ways, including from the very popular progressive cashpot, on the Deal or No Deal feature board, climbing to the top of the cash or feature ladders or from light the streak. Each potential jackpot offers one repeat chance allowing for the chance to win up to £200, and the repeat isn’t as rare as you may think, although getting the jackpot can be very difficult. 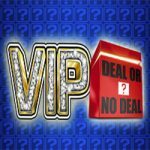 The most likely way to win the £100 jackpot is from the Deal or No Deal feature board, then playing to the end to be offered either the £100 or the cashpot. Deal or No Deal Star Prize has a progressive cashpot located on the bottom left of the gaming board. This progressive pot has three different values, one for each stake. The 25p stake can only reach up to £25, whereas the 50p and £1 stakes can both reach £100. As the pot builds with each coin played through the fruit machine, then the cashpot should be separate and not affect the gameplay prior to been won, however this is not always the case anymore, so just be aware of that. Deal or No Deal has a super board in the centre of the top glass. This looks very similar to the classic Bell Fruit Getting Ziggy With It, although that is where the similarity ends. It does however look very good, making use of the infinity glass and light effects that feature quiet heavily on the recent set of fruit machines. 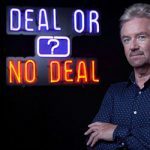 To gain entry to the top super board, light up three Noel Edmonds heads, this will then give you a more enhanced gaming board with increased wins and features. Aside from the super board, the main part of Deal or No Deal Star Prize is the DoND game board which can pay £100 or the cashpot. Additionally there is a gamble option in the form of the Box 23 button. You can gamble any Deal or No Deal wins up to a maximum of £100, but you can only press the Box 23 button once. The gamble will either pay an additional £10 to your winnings, double your money, give you your money back, lose half or give you 1p. The Deal or Bust button is progressive, as it is on the majority of this type of fruit machine. If the Deal or Bust button is pressed and offers the board, if you get a very low win, you will almost certainly be awarded the DoND game within the next three chances. The problem with this however is the cost of the boards in-between can be high. Play Deal or No Deal and gamble for Box 23. Possible to win up to £200. Bonus game box is not random. 2018 Goldieslots.com. All rights reserved.